Arne Kalleberg studies labor force issues at the interface of sociology, economics, and psychology. He has written extensively on the emergence of nonstandard work arrangements such as temporary, contract, and part-time work in the U.S., Asia and Europe. 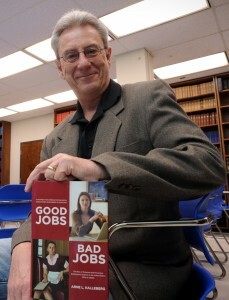 His book, Good Jobs, Bad Jobs: The Rise of Polarized and Precarious Employment Systems in the United States, 1970s to 2000s (Russell Sage Foundation, 2011), examines the growing precarity of work and the polarization of jobs with regard to earnings as well as non-economic rewards such as the control people have over their work activities and schedules, especially in balancing work and family. More recently, his book, Precarious Lives: Job Insecurity and Well-Being in Rich Democracies (Polity Press, 2018) shows how labor market and social welfare protection policies help to alleviate the negative consequences of precarious work by examining six countries: Denmark, Germany, Japan, Spain, the U.K. and U.S. He is also conducting a cross-national study of the politics of precarious work in Indonesia, Japan, and South Korea (with Kevin Hewison and Kwang-Yeong Shin) and co-editing (with David Howell) an issue of the RSF Journal of the Social Sciences on low-wage and nonstandard work in the United States.